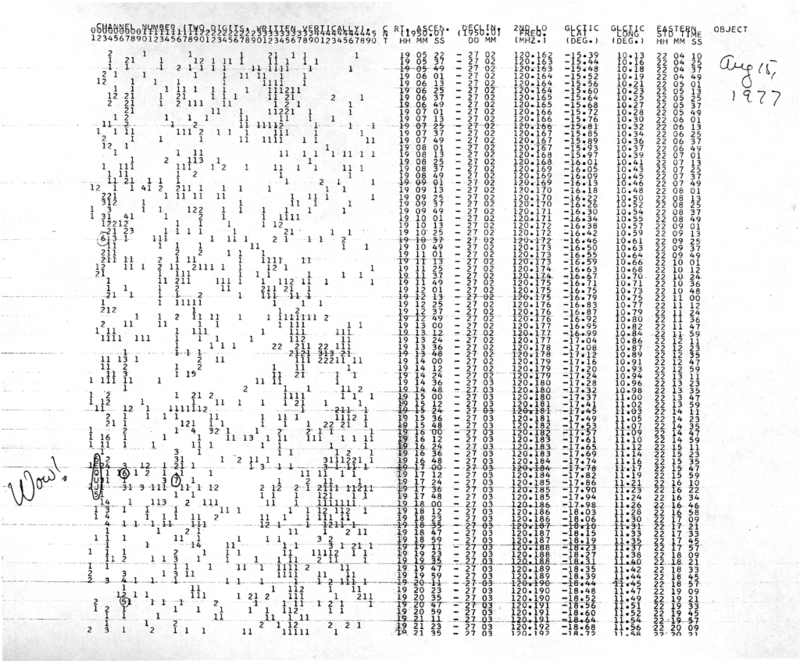 The Beale Ciphers – Very National Treasure, right?! And they could literally point you to an actual horde of gold! The Kryptos Sculpture – Bonus points because it actually looks kind of like a scarf. The Phaistos Disc – This would look better as a circular shawl, right? Tamám Shud – *shudder* Too creepy. Rongorongo – I feel like this would be neat as fairisle motifs. In the end I settled on the Wow! Signal. This was a strong narrowband radio signal detected by Jerry R. Ehman on August 15, 1977, while he was working on a SETI project at the Big Ear radio telescope of The Ohio State University. When he saw the spike on the printout, Ehman circled it and wrote “Wow!” in red pen in the margins. The signal lasted for 72 seconds. It came from globular cluster M55 in the constellation Sagittarius. It looks pretty much exactly like what we’d expect an interstellar transmission to look like. It’s never been repeated, and we don’t know what it means. I like to think it’s an alien civilisation saying “Hello!”. So I knitted it into a scarf. The scarf is knitted as a tube out of Morris Norway 10 ply in Cream using a 5mm circular needle. Starting from the left edge of the printout, I incorporated about 15 columns of numbers by duplicate stitching them on as I went. 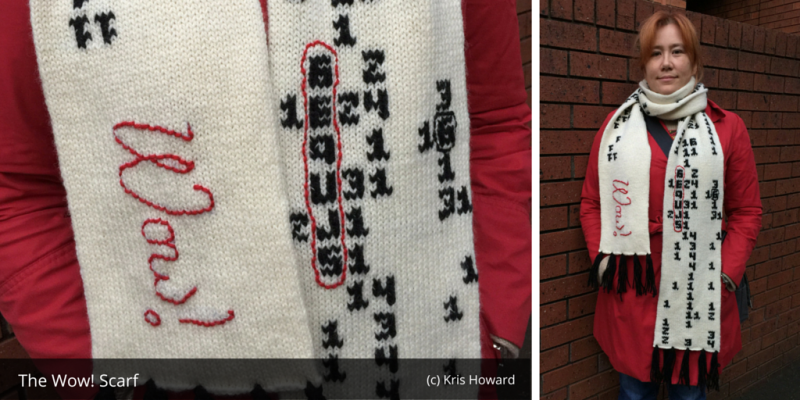 Once the scarf was long enough, I stopped the numbers and knitted in plain white to leave a space for the “Wow!” which I embroidered with red wool. I also embroidered on some additional pen marks, like the circles around the signal itself and some of the other numbers. As a final step, I added some tassles out of the remaining black wool. I’m really pleased with how it turned out! I didn’t end up winning the contest, but that’s okay. I took the “mystery” aspect more literally than most of the other contestants did. (The winner did an amazing double-knitted scarf with a photo of her cat on it.) My scarf is exceptionally warm and nerdy, and I had a lot of fun making it. Previous Big Cake Bake for the Red Cross! I made a pseudo-cherpumple with apple and berry pie inside. It weighed a ton.